Like other animal tattoos, parrot tattoos are strongly evocative of the traits and characteristics of that animal and allow the wearer to show off his or her own personality. Many cultures also see parrots as symbolic animals, and linking your design to a particular culture or artistic style is another way of expressing your own unique take on this animal. In general, the symbolism of birds is layered and meaningful: their ability to fly represents a need for freedom or escape; their songful melodies highlight the sounds of nature and the importance of communication; and their affinity for traveling in flocks demonstrates an instinct for loyalty and camaraderie. Parrots share these qualities with other birds, but have their own unique traits asw ell. Parrots by nature are very social creatures, and are also quite intelligent; indeed, they are known for their ability to speak human languages and 'parroting' their owners' speech. This communicative quality and importance of language might inspire your to get a parrot tattoo, as opposed to that of another bird, but then it's time to consider what type of parrot you'd like to represent in your design. There are several different species of parrots, but the most well-known, and most likely to be depicted in a tattoo design, is the Macaw parrot, which is recognizable by its bold and varied coloring. This species is also associated with pirates, who are often shown with a parrot on their shoulder while sailing the high seas. Parrots serve as important symbols in a variety of cultures. Parrots' affinity for speech and their ability to mimic human conversation makes them a symbol for communication in many cultures, as well as of a companion for humans. More specifically, parrots symbolize love and courtship in Hindu culture, where the god of love (Kama) chose a parrot as his symbol, and in Native American culture, the Hopi people in southwestern America believe the parrot to be a symbol of the South and abundance. Parrots are often found in tropical regions, such as the Amazon, and can therefore symbolize the habitats and rainforests of these regions. Choosing a macaw or toucan, easily recognizable and boldly colored, can demonstrate an affinity for environmentalism and concern about issues such as deforestation and global warming. When choosing what parrot tattoo design works best for you, consider if there is a particular culture or trait that you want it to represent, as this could add some incredibly uniqueness to your design. For instance, having a parrot tattooed in a totem design will link its meaning to Native American symbolism and culture, or indeed your own heritage. Parrots are a great unisex tattoo, and look great on both women and men. They are also easily adaptable to the size of the area you want tattooed - so whether it's a small parrot head on your inner wrist or a full-back design, you and your tattoo artist can work out a parrot design that best suits your needs. For many people, the parrot is almost synonymous with pirates and pirate lore: you can blame Robert Louis Stevenson, whose famous adventure story Treasure Island saw pirate captain Long John Silver accompanied by a parrot on his shoulder. This type of fictional account is not without merit, however: many pirates were based in the tropical islands of Bahamas, Jamaica, and other Caribbean hotspots, and likely pirates were in abundance there. Linking your parrot tattoo with a pirate can symbolize freedom of adventure, a 'live fast, die young' mentality (many pirates only sailed the high seas for a few years before being caught and executed), or simply an affinity for the history and legends associated with piracy. 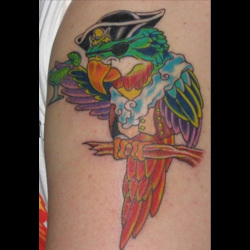 When designing a parrot tattoo with a pirate, there are a few different ways to incorporate the two elements. If you are a particular fan of Stevenson's novel , you can emphasize your fandom by designing your pirate in the vein of Long John Silver, peg leg and all! 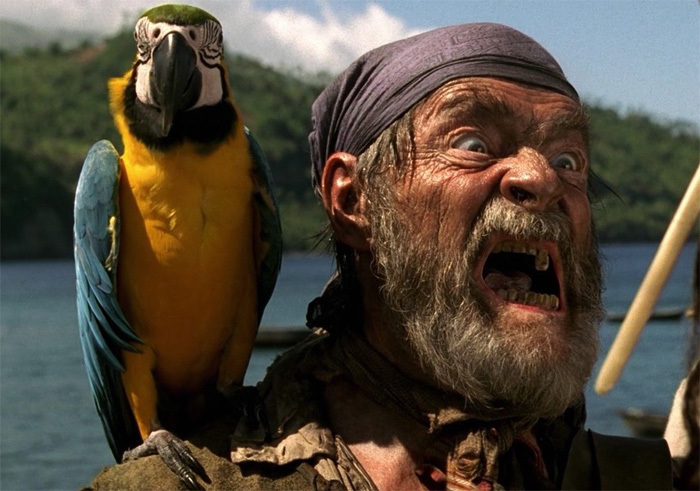 If you favor a different pirate (such as Calico Jack, Blackbeard, Ann Bonny, or countless others), or just want a general pirate design with a parrot sidekick, this can easily be achieved as well. Remember, both men and women were pirates, so this option is great for both men and women! 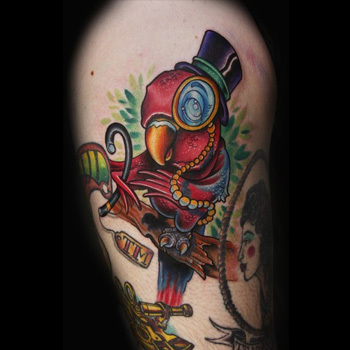 If you'd prefer a smaller tattoo or just a tattoo of the parrot, you can still inject a piratical element by putting an eyepatch or a peg leg on the parrot itself, or have it carrying a bottle of rum! As discussed above, parrots are symbols of love and courtship in some cultures, and the lovebird species of parrot is especially apt to convey this particular parrot tattoo interpretation. Lovebirds are smaller than some of the other more well-known species of parrots, but are just as intelligent and communicative, and arguably more fun and friendly. 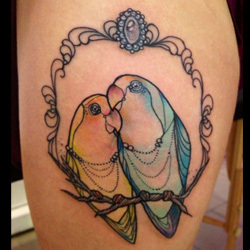 Lovebirds also thrive best when in pairs, making the lovebird tattoo a perfect symbol of love and friendship. This is a great tattoo to get with your significant other or best friend - so forget getting your spouse's name tattooed on you, get a pair of matching lovebirds instead! While some parrot tattoos are designed with a more cartoonish or comical edge, other parrot tattoos can be more evocative of nature: this can allow the tattoo to represent environmental and conservation issues, or your heritage and culture. A great way to accomplish this emphasis on environmentalism and/or the rainforest is to create a scene around the parrot: add in a few leafy trees, flowers, or a sun in order to fully draw attention to the parrot's habitat. One of the great things about parrot tattoos is that they look amazing on both men and women. The variety of species means you can get a more colorful or more muted parrot, depending on your taste and what the tattoo represents for you, and allows you to make your parrot tattoo as unique as you are! 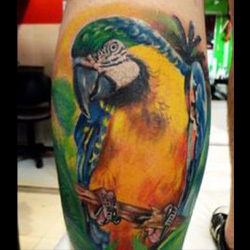 For custom design of a parrot, you can check our Custom Tattoo Page.